Lightning flashes over two million times a year across Canada, about once every three seconds during the more intense summer months. Many Canadians look forward to the summer camping season but this is also the season with the highest occurrence of injuries and deaths due to lightning. Over 65 per cent of injuries and deaths by lightning occur when people are participating in outdoor recreation activities. 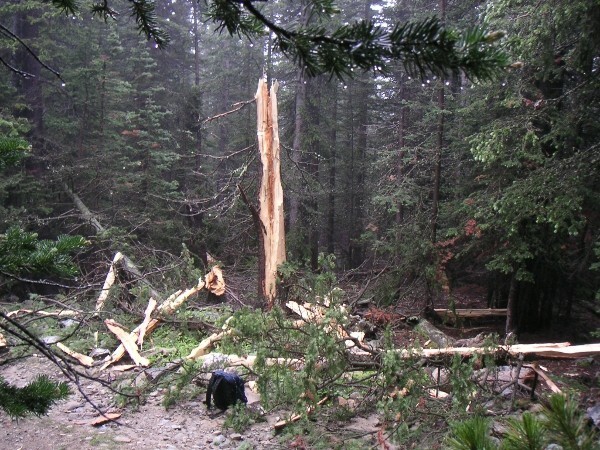 Campers and hikers are among those most commonly affected by lightning, often struck during a thunderstorm when they are in open areas (ground current ) or when taking shelter under trees (side flash). Research shows that a lightning strike that hits the ground can be fatal out to 10 metres. Some people have been injured 15 to 30 metres away from where a lightning strike has hit the ground. 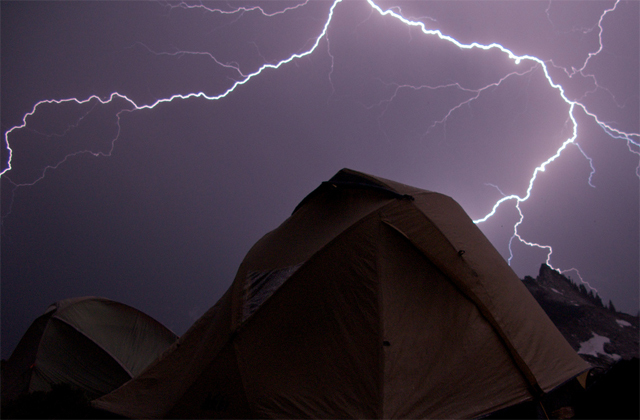 Lying on the ground in a tent during a lightning storm would maximize the chances of being hurt. One way to reduce your risk of being struck by lightning is by monitoring the Canadian Lightning Danger Maps on a hand-held mobile device. If the red danger zones are in or are approaching your location, go to a safe shelter and stay there until 30 minutes after the last rumble of thunder. 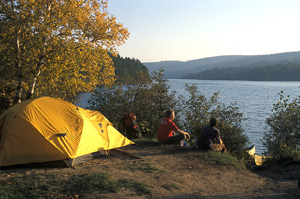 Avoid setting up your tent under an isolated tree or the tallest tree, close to a metal fence, or on a hilltop. 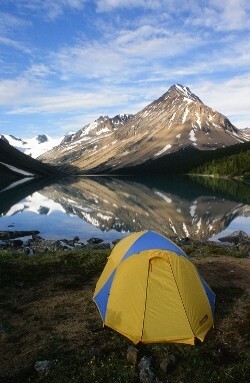 This looks like a nice spot for a tent. However due to the higher ground and the isolated tree next to the tent, this would not be a safe location in a thunderstorm. When you hear thunder, lightning is within striking distance. Find a safe location immediately, either in a building with plumbing and wiring or an all-metal automobile (not convertible top). Your tent is not safe. Outhouses – which don’t have wiring or plumbing to ground the lightning strike. If caught outside far from a safe location, stay away from tall objects, such as trees, poles, wires and fences. Take shelter in a low lying area. Stay in a safe location for 30 minutes after the last rumble of thunder. About one third of casualties occur after the storm because people return to outdoor activities too soon. A safe location such as a building with wiring and plumbing or a vehicle would be hard to find in the back country. The following are some suggestions to help reduce the risks of being hit by lightning while in the backcountry. However, there is no safe place outside during a thunderstorm. 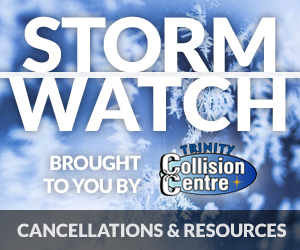 Watch the weather and know when storms develop in the local area. Plan to be away from high risk areas such as peaks, ridges and higher terrain before a thunderstorm arrives. If you hear thunder while climbing on an exposed mountain or ridge move to lower ground quickly. Avoid open areas that are 100 metres wide or wider. Look for a dry ravine or depression before a storm hits and spread out to reduce multiple injuries. Avoid trees with large trunks if lightning is striking close by. Mountainous terrain or windy conditions can often reduce the distance that thunder can be heard. Plan ahead, watch the skies for developing thunderstorms, and get to safer terrain to reduce the risks of being struck by lightning. Avoid setting up your trailer or recreational vehicle (RV) under an isolated tree or the tallest tree, close to a metal fence, or on a hilltop. If thunder is heard, lightning is within striking distance. Find a safe location immediately, either in a building with plumbing and wiring or an all-metal automobile (not convertible top). Lightning will travel around the outside surface of a metal-framed vehicle, essentially protecting the passengers in the vehicle from the electrical shock. This is called the Faraday Cage effect. As long as the passenger does not make contact with the outer metal shell i.e. by touching internal parts such as the steering wheel, radio knob or door handle, he/she will be safe. Pop-up campers with sides of fabric-like material. RVs made out of fiber-glass. A lightning strike will go right through the vehicle. An RV made out of steel or aluminum is ok.
RVs can also be affected by lightning if they are connected to a power grid (shore power) or when their jacks are deployed on the ground during a lightning storm. Remains of a shattered pine tree hit by lightning. Photo courtesy of National Lightning Safety InstituteInformation on this page was a compilation of various sources mentioned below.